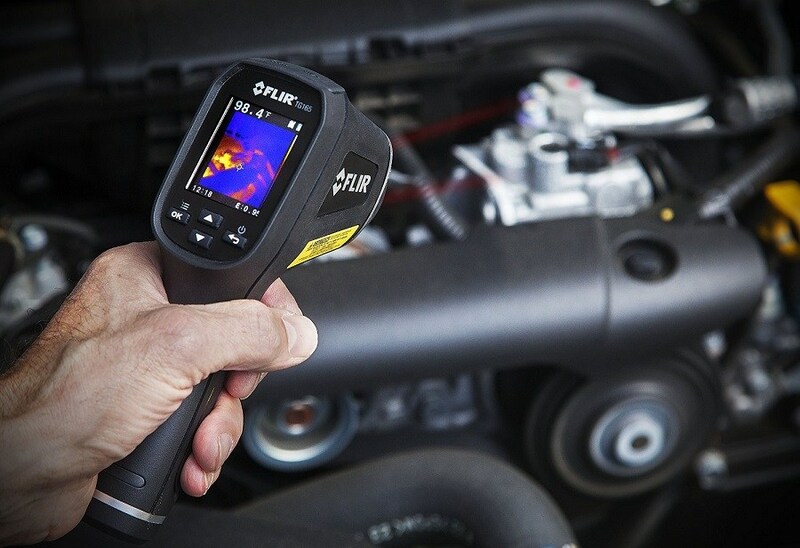 The FLIR TG165 is a highly affordable handheld thermal camera which provides just the basics, nothing more. 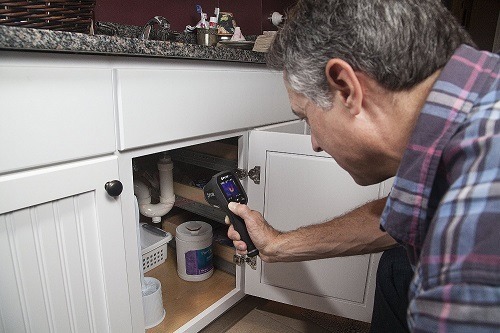 It does add a real time thermometer to the mix, providing a thermal camera/infrared thermometer hybrid that is very versatile. The FLIR TG165 isn’t a high-end thermal camera with countless features. It's meant to take the temperature and quick thermal images, nothing else. The FLIR TG165 uses two laser pointers that project onto the spot you want to capture. This lets you make more precise measurements of complex objects such as circuit boxes and switches, saving you time from all the guesswork. 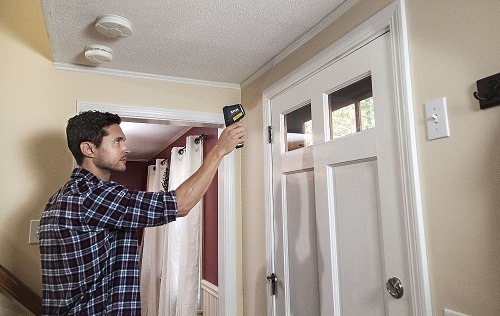 The FLIR TG165 has a 50-degree field of view that provides you with an easy way to scan an entire wall in one image. If you’re scanning large areas in walls and ceiling trying to locate things like missing insulation, you’ll have an even greater appreciation for the wide view. FLIR made the TG165 as simple as it can be. No special training is required, and the buttons on the interface are all pretty self-explanatory. All you need to do is point, pull the trigger, and you’ve got yourself an image. On board storage is ample. The FLIR TG165 can store up to 75,000 images on its 8 GB SD card, in case you’re feeling very trigger happy. Transferring image files to a computer can be done using the included USB connector or an adapter that reads SD cards. If you need more space, the FLIR TG165 can accommodate a 32 GB SD card. Often the downfall of other thermal cameras, the FLIR TG165 can stay alive for up to five hours while scanning with lasers. The FLIR TG165 is tough. You can drop it from up to 6.6 feet high and it won’t faze it. The FLIR TG165 is a great thermal imager, but the image resolution and display are not the best. The FLIR TG165 is an inexpensive thermal camera, but it would be nice to have slightly more image resolution than 80 x 60 (for the money). A little more image clarity would be nice, along with a slightly bigger screen to look at it with. The FLIR TG165 has just three color palette selections: iron rainbow, and gray. For the money, it’s hard to find a better value than the FLIR TG165. You get a wide view, really easy operation, great battery life, real time temperature measurements and laser pointers. 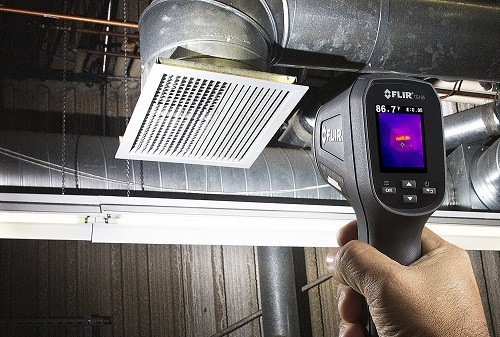 The FLIR TG165 is a super value workhorse that won't fail you. But it's not the right choice if you need to remain connected on the job. Buy this if you want a thermal imager that can be used for hours uninterrupted, and also provides pinpoint accuracy while covering large areas. 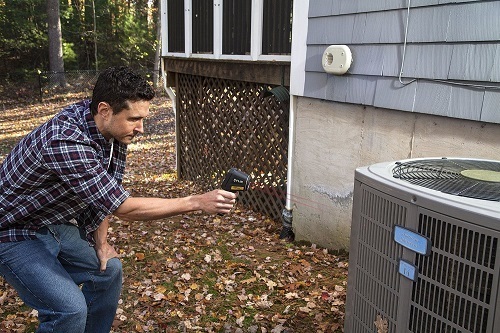 Perfect for building inspection, HVAC troubleshooting and electrical surveys.